This Railroad Crossing Signal Track Detection and Light Driver Board operates from accessory voltage (AC or DC). On board are up to two detection circuits, a realistic flasher for the LEDs, and circuitry to support gate operation. Typically railroad crossings are activated by a train coming from either direction. And continue to operate until the train leaves the protected block. On your railroad, this protection block may be defined by Infrared beams or isolated rail (3 rail O Gauge). The IR signal can support up to 5 parallel tracks and the IR beam will stretch 25″ reliably (and more with good alignment!). The height of the beam may be at wheel level or car/engine body level. In addition, this board also supports isolated sections of track. Why both? Simple; some model railroaders use the isolated track to trigger occupancy signals for small or large section of track. 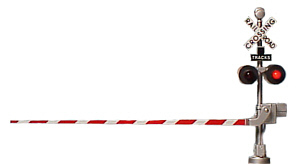 Our approach allows a separate source for detecting a train in the protected crossing block. So far I have sold more units to O Scale folks who rely on the IR approach. 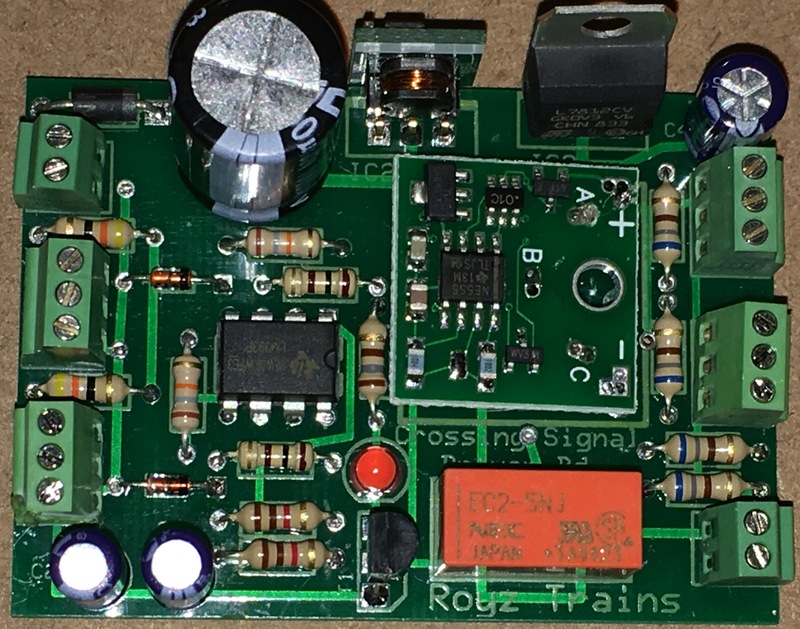 This Driver board may be used in any scale with common anode LEDs in the crossbucks. These include Tomar and others. If you have a specific application, contact us to see how to best support you. The Flasher board used is from Ngineering. Prototypes of this unit are in the hands of a limtied number of customers as we work to ensure full, proper operation. When bugs are fully worked out, additional infomation will be provided. 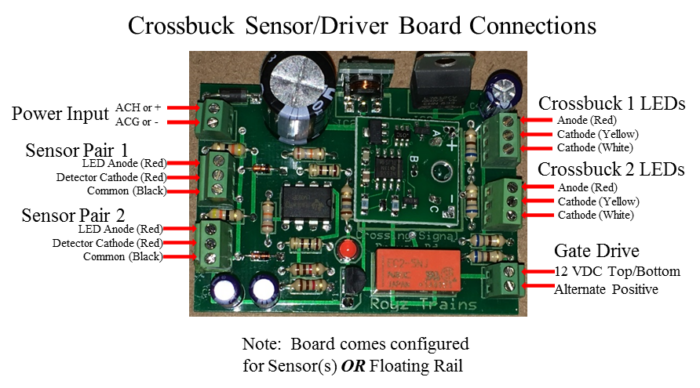 The board may be used for any common anode LED signals such as Tomar and Custom Signals. And operation supports multiple scales. Provision is provided for two pairs of IR transmitters/receives that can span 24″. The sensors would be place either side of the protected tracks and could be camaflaged in shrubbery, painted to look like short poles, or hidden in nearby buildings. The primary advantage of using the IR beam is to limit cutting and isolating a section of track. 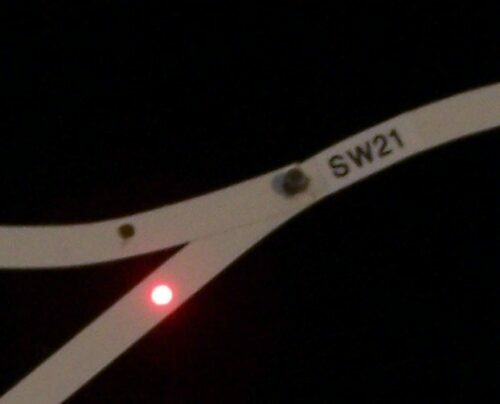 In addition, these sensor pairs may be moved if necessary. In addition, if block occupancy is used, the isolated track would already be used. The objective is to have about 2 secs of delay before turning off the signal control to allow for openings in the train or between objects in the undercarriage of the train. Got questions? Just drop us a line!